The proposal, which has been in the planning for nearly two years, envisions the creation of a new 3.3 million-square-foot complex called Hoboken Station on the riverfront amid the Beaux-Arts style arches of the historic Hoboken Terminal. In addition to the 18,500-seat arena, the complex would include a 20-screen multiplex theater, retail stores, theme restaurants and waterfront parks. It would require completion of [a] proposed waterfront expressway project, a highway planned to run along an abandoned railroad right-of-way called the Bergen Arches from the New Jersey Turnpike through Jersey City and then to the Hoboken riverfront. 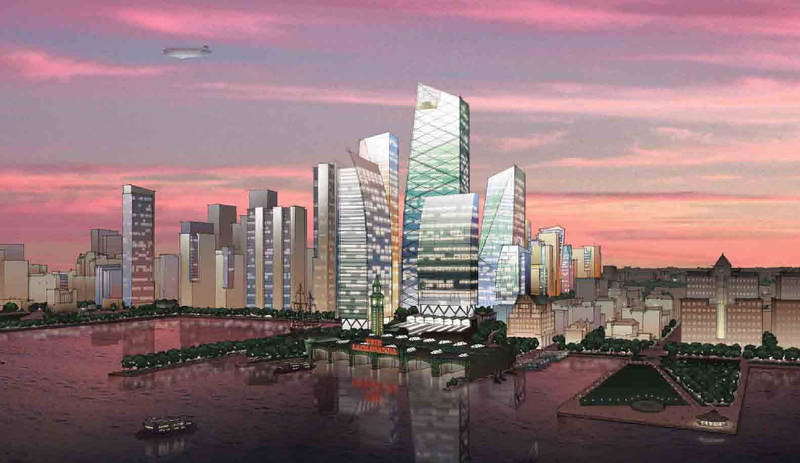 But this project is still in the planning stages and without construction financing. That plan would have destroyed Hoboken Terminal as we know it, and an extension of the New Jersey Turnpike through the Palisades to Hoboken would have destroyed the scale and character of Hoboken. A campaign by local advocacy groups ultimately resulted in a City Council resolution blocking the arena from being built over the terminal and rail yards. In the process, the agency hopes to unlock the earning potential of an underused resource by adding stores, restaurants and possibly apartments on the 65-acre site. If passengers treat the terminal as more of a destination, it will in turn increase passenger trips, the thinking goes, which will generate additional revenues. Ultimately, New Jersey Transit might collect rents from tenants that never existed before. Though few specifics have been spelled out, the idea is to make better use of idle railyards and dormant platform space, as well as sections of the terminal that have been closed to the public for decades, those involved in the deal say. A renovated terminal, they added, would also fill in a sizable gap in New Jersey’s swiftly developing riverfront. It is important to develop underutilized sites such as the Hoboken Terminal & Rail Yards at a sufficient density to make the redevelopment plan both economically viable for private sector developers and to generate enough revenue to finance public benefits. It doesn’t make a lot of sense for municipalities to adopt redevelopment plans that aren’t economically viable for the private sector to undertake. There are many such plans and, too often, they sit on the shelf for years after adoption. In this case, the public has an added interest because the site is owned by a state agency, NJ Transit. Therefore, maximizing the economic benefits of the site means added benefits for the public, in the form of infrastructure improvements to the public bus terminal, new and enhanced public open space, street upgrades that would improve pedestrian and cycling safety, and affordable housing. The City’s revised Plan calls for a baseline 2.176 million square foot mixed use project with an additional 125,000 square feet of commercial space permitted if the commercial space is architecturally creative and designed to LEED Gold standard. Two-thirds of the overall plan is for office space and one-quarter for residential space, with the remainder for retail space. 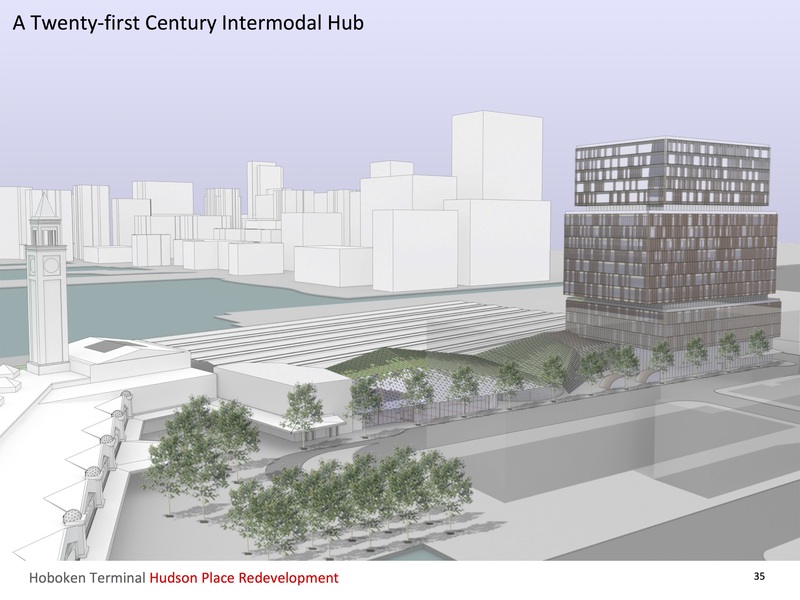 The plan would create a true mixed-use project that will significantly diversify the local economy, support local businesses, and revitalize the Hoboken Terminal area and Observer Highway area – an essential gateway to Hoboken. 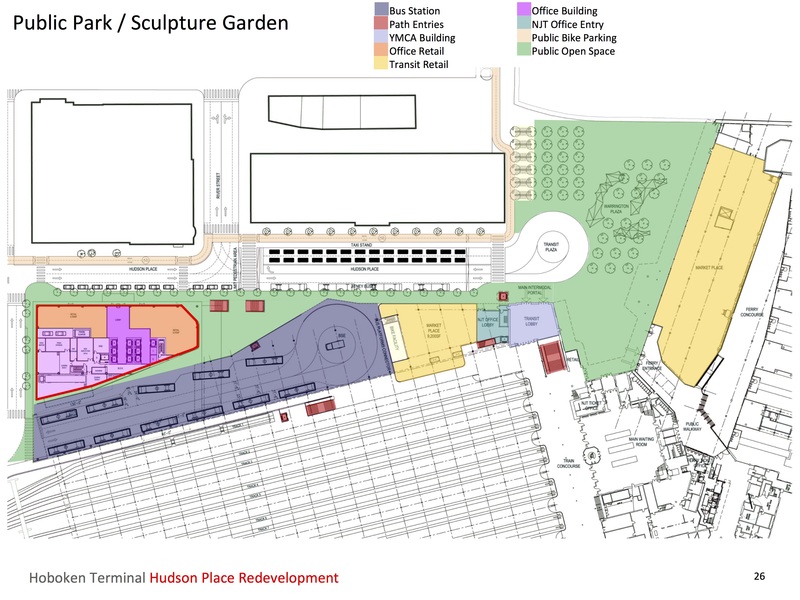 The Hoboken Terminal and Yards Development Plan, approved by the City Council, includes the creation of a pedestrian plaza at Hudson Place. 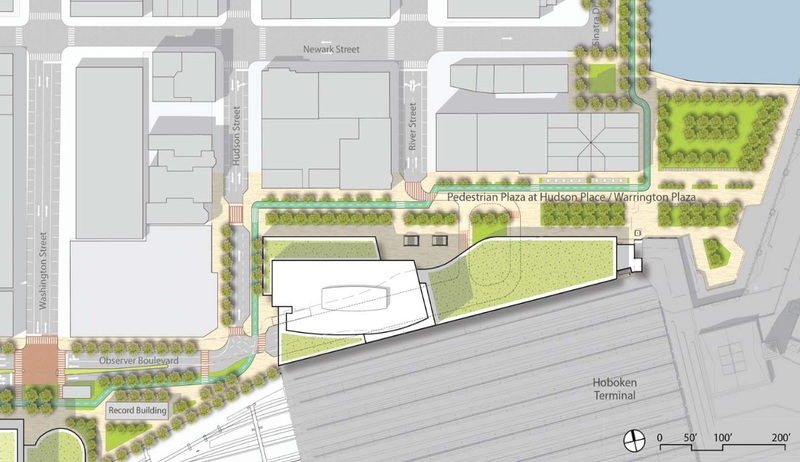 The plan reduces pedestrian/vehicle conflict near the terminal by converting Hudson Place into a two-block pedestrian plaza between Hudson Street and Warrington Plaza, with a single lane drop-off loop at the southern end of River Street. A bike lane would connect Observer Boulevard via the pedestrian plaza to the existing waterfront bike lane parallel to Sinatra Drive. 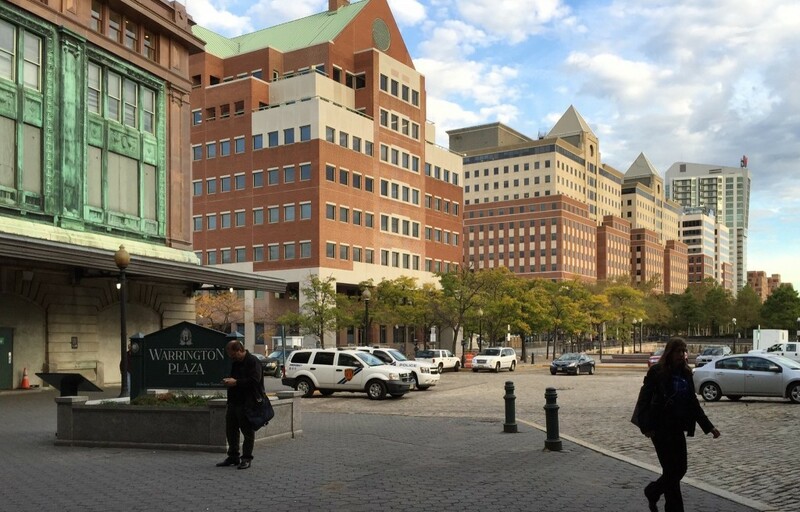 During a presentation to the Hoboken City Council in October, Brandy Forbes, the city’s Director of Community Development, noted that the revised plan takes into account resident concerns about infrastructure burden, parking, and open space. The plan will encourage parking in garages included in redevelopment, and discourage on-street parking on streets in the immediate vicinity of the redevelopment. Among the options Forbes said the city is considering: possibly not providing on-street parking permits to residents of buildings in the development, providing some free parking in building garages, and potential city management of garages to keep parking costs down. Forbes also noted that the single largest component of the plan is commercial space, which broadens the city’s tax base while placing less burden than residential space on the city’s infrastructure. The current plan allots 23,000 square feet for an indoor, multi-use public space. Previous plans designated this space as a performing arts center, but the current plan broadens the scope to accommodate more potential community uses. The cash flow model indicates that the IRR [internal rate of return] of the project will be 12.9%. This is at the high end of the minimum range of pro forma rates of return in the New York – New Jersey Market as reported by the “Realty Rates” survey in the 3rd Quarter of 2014. These minimum rates of return ranged between 11.42% and 12.96% depending on the use. These minimum pro forma rates reflect forward looking revenue and development costs and are used as a measure of viability by lenders, investors and developers. For over a century, Grand Central Terminal, Hoboken Terminal, and Penn Station have served as steadfast anchors of New York’s transportation system, and their presence makes the land around them among the most important in the region for transit-oriented development. Their importance – both to their surrounding neighborhoods and the wider region – demand that major projects like One Vanderbilt, Hudson Yards, and Hoboken Yards are models for good development. The current plan for Hoboken Yards creates a true urban neighborhood at the southern edge of Hoboken that appropriately balances the city’s scale and context with the opportunity – and responsibility – to build sustainable, transit-oriented development that benefits the city and region.